This New Moon ushers in the Planting Moon cycle and kickstarts the season of Spring; a period of change and transformation on many levels. In the Northern Hemisphere we are experiencing the shift into Spring while the Southern Hemisphere will be shifting into Autumn. The cycles that hold the solstices and equinoxes also often hold the greatest potential for lasting change. This Pisces New Moon may be causing us all to feel extra sensitive and vulnerable right now. We are all swimming these deep dark waters of rebirth. Be gentle with yourself and be gentle with others. New life is beginning to sprout all around us as the Earth is ready to give birth to Spring. This cycle has the power to bring about dramatic change in your life if you allow it. Ostara takes place on the 20th of March and we leave behind this harsh, dark Winter. The Sun moves into Aries on this day bringing new invigorating energy to us all, while Mercury is going retrograde this month for the first time this year on the 22nd of March. During this cycle we will experience many astrological influences that will hold lasting importance for our lives. This New Moon cycle holds the lessons you need to expose the wound that’s been holding back your healing process. This cycle is all about getting real with yourself, the reality you’ve been holding on to, and what you are willing to let go of to get the things you want. Grab a cup of coffee and read on to see how this New Moon cycle can help you grow and transform into your best self. This New Moon in Pisces is conjunct Chiron, while Mars goes into Capricorn today. This can create some tension in your day and you may not feel like things are going the way you want them to despite your best efforts. We also have Mars, Saturn and Pluto in Capricorn right now, which can add even more heaviness to the day. Mars likes conflict and war, Saturn favors learning things the hard way, and Pluto loves to expose the truth, dig deep and is associated with death and rebirth. This is setting the stage for the future. What you say and do during this time holds lasting importance for years to come. So set your intentions tonight and be ready to do the work needed to achieve your goals. It may not feel like there is much you can do right away, but trust in the day to day steps you can take and take them. Today might cause some unexpected issues to arise, problems from the past may come up in order to be healed for good, and we might be feeling extra sensitive and raw with this New Moon in Pisces. Again it's important to tread lightly and be gentle with yourself and others. Mercury goes retrograde on the 22nd of March in the sign of Aries. This may cause you to question where you are at and where you want to go in the future. Aries is the sign of initiation and inspiration, but you may feel a sense of back peddling on some of your projects as Mercury appears to go backwards in the night sky. Take this time to relax and allow yourself some of the relief you’ve been needing. Go with the flow if you must move at all. They say when you are lost, you should just stay where you are, and this often applies to Mercury Retrogrades. If you find yourself in a lost or confused state, focus on your self care and make your own needs a priority. The card pulled for this phase is Surrender, a great reminder for the retrograde season. Mercury Retrograde has a way of showing us what needs attention in our lives. Instead of fighting against it's messages, work with them. Go with the flow. Realize that whatever comes up has needed to come up for a while now and you are now at the awareness to handle it. Take the steps towards solving the problems rather than working against them. The First Quarter Moon takes place on the 24th of March in the sign of Cancer. This is another reminder for the deep need of self care and nourishment right now. The Moon is in her home sign of Cancer, so you too may feel the need to focus on your home; the physical space you live and your physical body where your soul lives. The First Quarter Moon acts as an igniter; we feel more energized as the moon grows brighter, but the retrograde season may be pulling your attention away from actively making progress on some of your goals. Don't beat yourself up about that. Instead, focus on your environment and your surroundings. "When a flower doesn't bloom you fix the environment in which it grows, not the flower." - Alexander Den Heijer. Don't be too hard on yourself if you aren't seeing results from your efforts just yet. Flowers can not be expected to always be in bloom. Take the time you need to focus on your environment and make sure it is the most nourishing space possible. The Full Blue Moon takes place on the 31st of March in the sign of Libra while Venus goes into Taurus the same day. The Moon in Libra is all about harmony, fairness, balance and weighing out options- while the Sun in Aries is spontaneous, headstrong, courageous and ready to fight for what's right. This could cause some conflict with others as well as within ourselves. Saturn is still a big influencer right now, trying to keep us serious and Libra loves to ask questions. Are you being honest with yourself about the things you really want? What are you willing to do do get the things you want? What parts of yourself are you willing to let go to get the things you want? What will grow from this? This seriousness can be a good thing. Saturn reminds us it's time to grow up. It's time to fight for the things we really want in our lives, and it's time to learn how to fight with the power of grace instead of what has not been working in the past. Venus moved into Taurus today as well, bringing a heightened awareness towards the beauty and the numinous that surrounds us, as well as bringing in our attention towards what needs healing and nurturing. Finding and noticing the beauty in the mundane can really help lift your spirits today and set the right tone and mood for the week ahead. This Full Blue Moon is the Planting Moon. This is the time when the soil begins to get soft enough for planting seeds. Seeds are able to root deep, and sprouts can finally push up as the Sun warms the Earth. This is also a time when we begin to see breakthroughs and progress of our own hard work and efforts. This Full Moon is a powerful time for our goals. Check in with your New Moon intentions today. Notice the progress, and see what the next steps are. Write a gratitude list or put together a crystal grid to reaffirm your intention. The card pulled for this Cycle is Taurus- The Lover. Another fun one to see with Venus moving into Taurus today! But the focus of the card this week feels to be pulled towards Mother Earth. Get your hands dirty this week, play in the garden, plant something. Walk barefoot on the Earth, sun bathe.Connect to Mother Earth anyway that you can. This will not only help lift your spirits by being surrounded by her beauty, but it will also keep you grounded and mentally clear. The Last Quarter Moon takes place in the sign of Capricorn on the 8th of April. Venus in Taurus is trine Saturn in Capricorn on the 7th, so you might be feeling a sense of harmony and balance as the Moon moves into Capricorn as well. April is finally a bit of a normal month. January had 2 full moons, February didn't have any, and March has 2. So April will finally bring a sense of normality to our lives again. The Moon in Capricorn can make us feel more disciplined towards our goals. The responsibilities we may have been putting off will seem a lot easier to focus on and we can all kind of take a breath of fresh air as our goals seem a bit easier to attain. The last Quarter Moon is about a wind down of energy, when unfinished projects make themselves known to us and we feel the pull to tie up loose ends. The energy of Capricorn is slow steady and disciplined so there is no need to feel overwhelmed at this time. Mercury is still Retrograde, so remember to go with the flow and do what you can with what you have right now. The card pulled for this phase is Waxing Gibbous- Strength. It might feel like this past cycle has been testing your strength and will power, and it probably has! But you have grown so much stronger for it. This cycle was a big one, and you might feel like you don't have much left in you. but seeing the Strength card shows that there IS still some strength within you. Strengthen your resolve and stay on your course. Whatever you are going through is building you for your next level. Call upon your inner strength and discipline yourself to finish your goals this week. Remember to not be too hard on yourself as Mercury moves into Retrograde and we experience the shift of Saturn into Capricorn this cycle. The words you speak are like seeds that you plant! Be careful of the things you say. Be sure they are feeding your dreams and watering your seeds! Remember to take the time and energy to focus on your environment and space. Make sure it a nourishing and safe place to grow. 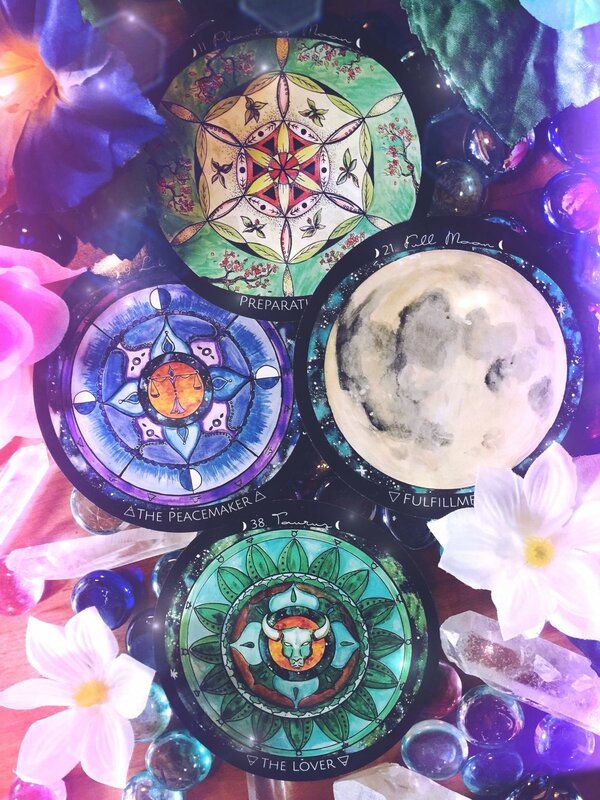 Don't forget to charge your crystals and your decks under the New Moon tonight and set your intention for this powerful cycle ahead! This is the first New Moon of the new season and holds some powerful transformative energy! This Planting Moon cycle begins in Aries, the first sign of the Astrological Year; making this a very powerful New Moon for planting something new. If you missed your New Year's Resolution, now is your chance to establish some powerful new intentions! The Sun has also moved into Aries, giving us all a sense of a rebirth and preparation. In the Northern Hemisphere we are emerging from the depths of Winter preparing to build something new. Our friends In the Southern Hemisphere are preparing for the rebirth that their Winter might bring. We have put together this New Moon Energy Report based on the lunar, astrological and seasonal energies ahead. We also drew a card from the Spirit de la Lune deck for each turning, to provide deeper insight into Lady Luna's messages and lessons. Grab a cup of tea, & read up on the cycle ahead. What is it that you are planting? The New Moon in Aries occurs on the 27th of March. A New Moon in Aries brings forth some exciting energy. Aries are known for their zest, fiery drive and "yes" attitude. But it's important to remember that New Moon's are not always about action. This New Moon may be asking the Aries in you to practice your patience and deliberation. Because this New Moon in Aries is conjunct to Retrograde Venus in Aries, we may have some aspect of our relationships tested. The Aries energy is very potent right now, aside from Venus; Mercury, Uranus, the Sun and the Moon are all in Aries right now! Remember that words are seeds, and the ground is very fertile right now. Be careful how you react in the beginning of this lunar cycle. Watch your responses, and be careful how you react when triggered. It's just not worth it to stir anything up or say something you will regret later. Practice control in the present moment to avoid damage control in the future. The Card pulled for this phase is the Focus Card. Aries energy is very spontaneous, and since we have several planets in the house of Aries right now, it's important to keep a focused mind. Aries is also a sign of will power and action. Use your focus of thought and your will power to help pave way for the action to be taken later. This New Moon is a time of preparation, and feeling into the new energy without doing anything too sudden. All of the rash spontaneous energy may feel like it's testing you. Remember to tap into your Will and focus during this New Moon. Make some intentions, and keep your mind's eye focused on what you want and where you are going. The First Quarter Moon takes place in Cancer on April 3rd. Cancer brings in increased emotions, imagination and a sense of vulnerability. While the First Quarter Moon ignites our energy, the sign of Cancer might be asking you, on a personal level, what you want to ignite. You may feel pulled to stay home, to avoid large groups of people and to only interact with those closest to you. Listen to your intuition. 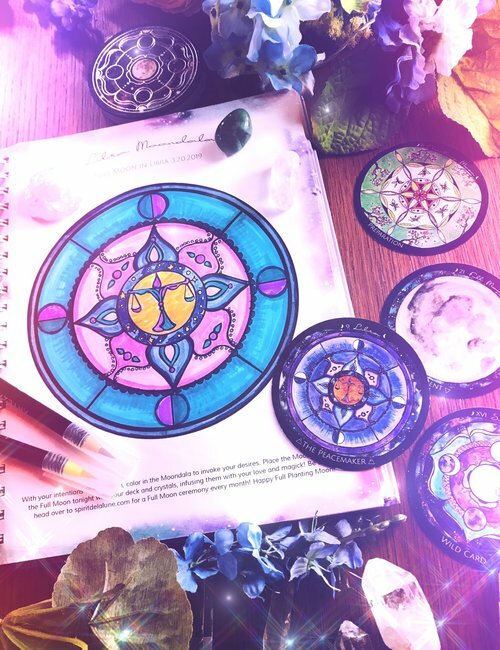 This energy may have you putting some of that New Moon Energy into creative action! The card pulled for this phase is the Create card. Begin creating something physical to do with your goals and intentions. Now is the time to begin taking steps. Create a vision board, set up an altar, take any small creative action towards your goal. The fiery energy of the First Quarter Moon paired with the intimate energy of Cancer is asking you to dig deep into what you can create for yourself and your family. The Full Planting Moon takes place on April 11th, in the signs of Libra and Scorpio depending on where you are. This is a time of fulfillment and gratitude for the steps we have taken so far. The Planting Moon Reminds us that there is still progress to make. The ground is still fertile for the seeds of your intentions, and great care must be taken in the garden at this time. Don't forget to check the blog on the 10th of April for the Full Planting Moon Ceremony! The card pulled for this phase is the Taurus Card. The Taurus Card is also known as The Lover card. Being an Earth Element, this energy is all about nurturing growth. This could be asking you to take time in your physical garden connection with the Earth. Or perhaps give your mind's garden some extra love and attention. Meditate on your intentions, get rid of the weeds and self doubts you might have. Show yourself extra love on this Full Moon. Be thankful for how far you have come, and eager for what lies ahead. Last Quarter Moon on April 19 in Capricorn and Aquarius. The Last Quarter Moon takes place on April 19th in the sign of Capricorn and Aquarius depending on your location. The Last Quarter Moon helps us wind our energy back down, and prepares us for the internal shift the New Moon will bring. You may feel your intuition and instincts heighten as you turn inward and reconnect to your self. There might be a sense of tying up loose ends and finishing up tasks, especially with the influence of this Capricorn energy. Now is the time to take on any responsibilities you've been shirking, and prepare for anotherlLunar cycle. The card pulled for this phase is the Connect Card. With Venus out of retrograde, you may be feeling pulled to reevaluate your social connections. Hopefully there won't be anything that needs mending or re-connecting, but now is the time to make amends and establish healthy connections with your loved ones. This energy may also be asking you to tie up loose ends within your personal or work correspondences as well. As the energy shifts back to New Moon, you are also asked to connect with your Self. Don't forget to charge your decks and crystals tonight. This is a very potent and powerful New Moon for intention setting, preparation and releasing. Check the blog on the Full Moon for the Planting Moon Ritual! The Spirit de la Lune Deck is Back!! We are so happy to announce that the deck is back in stock! The current shipping and processing time is 5-7 business days.